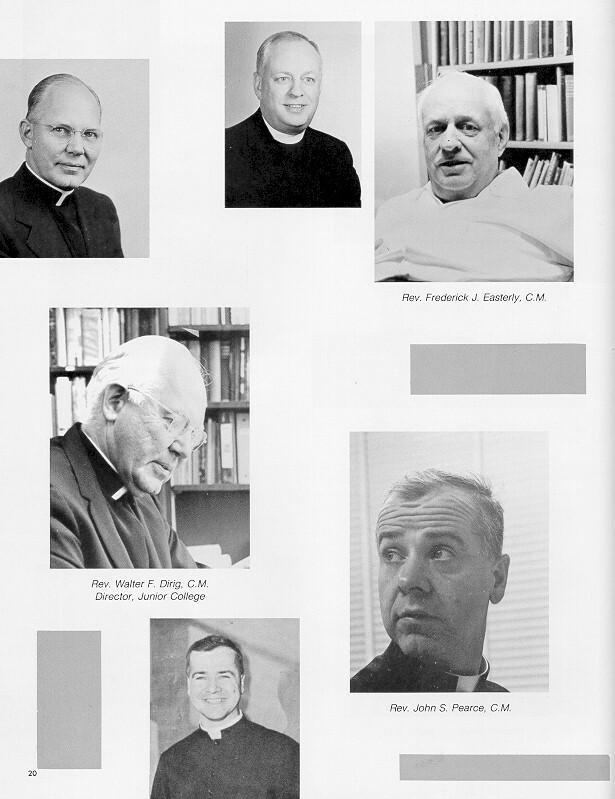 From left to right: Fathers John Young, Bernard Reilly, John Fisher, John Fisher, John McDonnell, Fredrick Gaulin, Paul Day, Albert Perron, Michael Farren, Henry Bradbury, Vincent Trunk, Michael Kennedy, Martin Peterson, John Buckley. 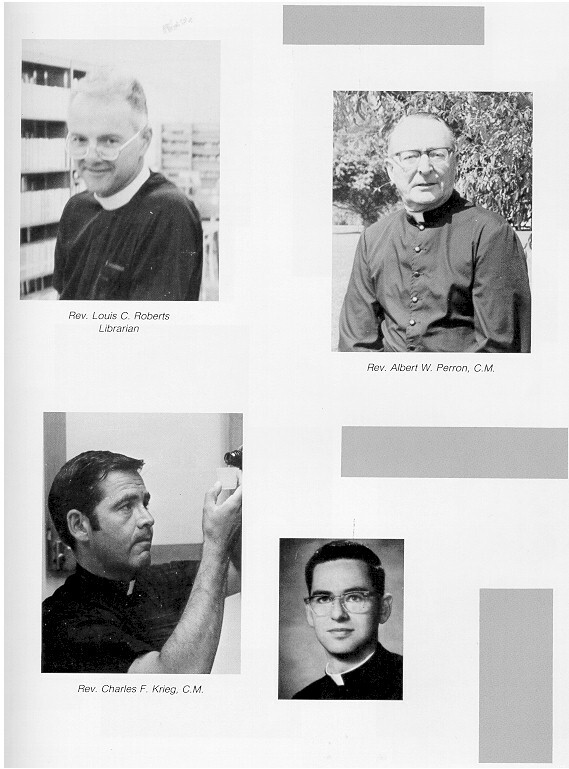 All of the Vincentian Fathers have left us with memories of education, the old fashioned way. Please take a moment to reflect on the impact these men had on us. Rev. William J. Bamber C.M. Rev. Henry M. Bradbury C.M. Rev. John J. Buckley C.M. Rev. John W. Caine C.M. Rev. John A. Crowley C.M. Rev. Frederick J. Easterly C.M. Rev. Michael V. Farren C.M. Rev. Willaim R. Grass C.M. Rev. Keith R. Krusky C.M. Rev. Martin F. McGeough C.M. Rev. Robert F. Morris C.M. Rev. Albert W. Perron C.M. Rev. Martin C. Peterson C.M. Rev. Thomas P. Powers C.M. Rev. Vincent E. Trunk C.M. More current information can be found here for the living and here for those who have passed. Msgr. 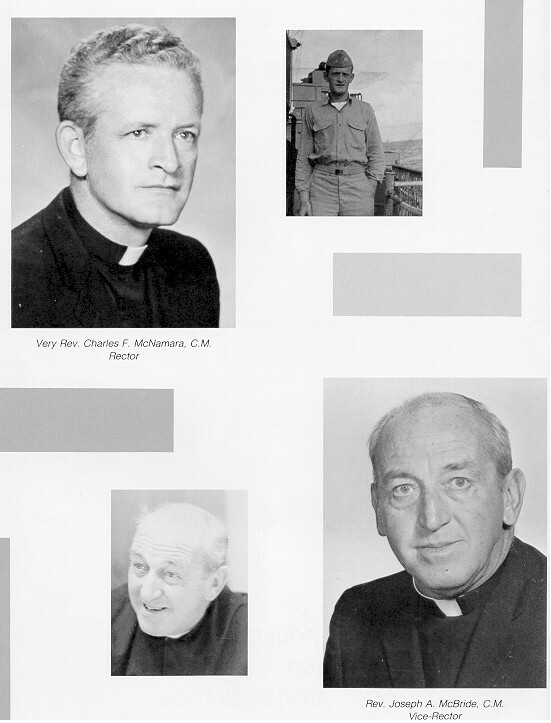 John Nevins lived on campus before he became an Auxiliary Bishop. Here is information about his current post. 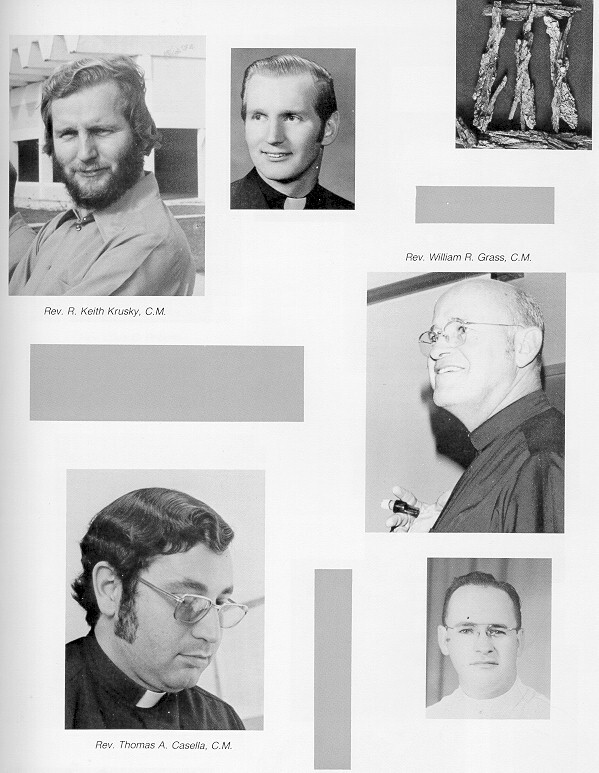 The bear story… That's a very funny memory from my Freshman high school year at St. John Vianney in Miami. Fr. 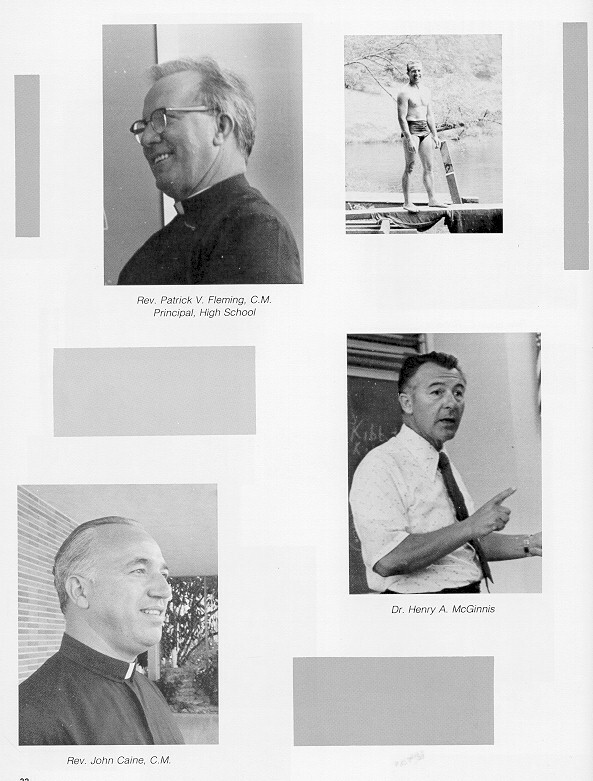 Patrick Fleming was our High School Principal, and the Freshman Biology professor. I remember a party one night in the Freshman / Sophomore lounge. Two very vivid memories from that night. Our Rector, Fr. McNamara, who had a deep and scary sounding voice when he wanted to, singing funeral dirges at the piano. 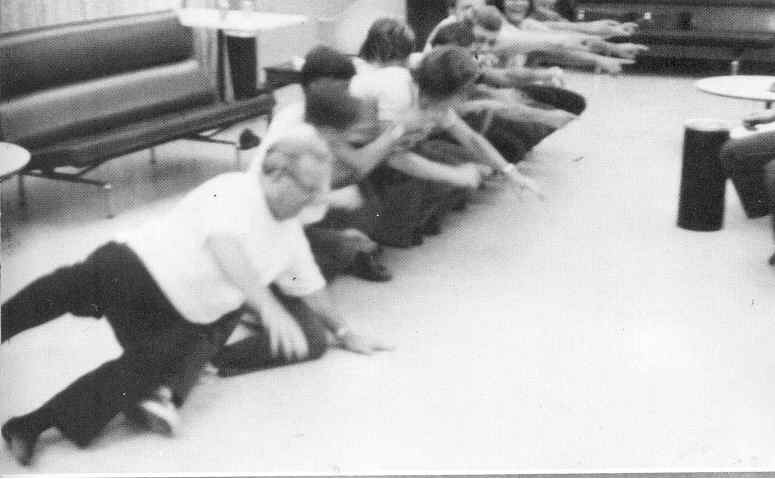 "as the students slowly filed into the examination room…"
We new and nervous freshman had to line up, shoulder to shoulder, with Fr. Fleming at end, on our right. The sophomores look on, smiling. The guy to his left has to say "Where?" Father raises his right arm, points to an imaginary bear in the distance and says "There!" The arm stays raised. Knowing Fr. Flemming, I'm sure there was a story to go along with all this, but it's lost in my memory. From here the student to his left says the same thing "I see a bear!" The next one, "Where?" "There" and the next person's arm goes up and points in the distance. We get to end of the line. The attention goes back to Father. There may have been more of a story here, but that's lost in my memory. He says again "I see a bear"… "Where?" This time, Fr. also raises his left arm and points in the distance. 'There!' The same thing goes down the line. Well, I guess everyone is still a bit blind, so Father tries to help us see the bear again, this time, he squats down, continuing to point with both arms in the distance. And so it goes down the line. So picture it, a line of freshman, in a squat, both arms up, pointing ahead. What's next in this story? Father leans to his left… over we all go, like dominos. Not sure if there was a moral here, maybe a simple example of peer pressure, or maybe it was a badly needed ice breaker to get us all laughing at ourselves for 'falling' for such a silly story. Fr. Fleming would go on to be one of our most memorable teachers. Another story that comes to mind. Every February, there's a large fair, the Dade County Youth Fair, a couple miles west of campus. A few of my fellow freshmen were invited to go with Fr. Fleming one afternoon. We all crammed into an old station wagon with Father at the wheel. Of course, we were supposed to be there to see the science fair exhibits, but of course in no time we were out on the midway checking out the rides. There was one in particular, the Super Himalaya, that was idle when we came by. The midway was fairly empty in the late afternoon, so the rides weren't running all the time, but when you got a ride, it was usually long. We came SO close to getting Fr. Fleming on the ride! 'It's just like a merry-go-round' we all assured him. He started to join us on the ride, but in retrospect, it was probably a good thing for (for us) that he didn't. It's a really fast and loud spinning ride that, scientifically, is a great demonstration of centrifugal force. Thinking back to my memories of him, although he wasn't close to our age, he always had a certain youthful attitude. He would jump around in class to make biology more interesting. He always had a story, a silly joke, or anything to make us learn with a smile on our faces. He'll be missed by every one of us who were lucky enough to be in his class. > Tomorrow we bury Fr. Vinnie Trunk. He suffered a great deal over the past few years. He was one of the most simple, humble men I ever knew. I presume that you were there with him at SJV. "Fr. Trunk was one of the most kind and gentle men I have had the privilege of knowing. I’m sorry that the world has lost him."